People in some sections of the country are interested in canning mountain trout and others live where there is an abundant supply of either fresh-water fish or salt-water fish. Heretofore we have been wasteful and lax about the fish supply. But as we have learned to can vegetables and meats so we are going to learn to can fish. The steps for canning fish are actually the same in every step after preparation as peas and corn are canned. In order to have a good product, fish must be fresh when canned. No time should be lost in handling the fish after being caught. Putrefaction starts rapidly, and the fish must be handled promptly. The sooner it is canned after being taken from lake, stream or ocean, the better. Never attempt to can any fish that is stale. As soon as fish are caught it is advisable to kill them with a knife and allow the blood to run out. Scale fish. This is easily done if the fish is dipped in boiling water. For canning fish, most varieties of species need not be skinned. If the fish is very large and coarse, the large back fin may be cut out and the backbone removed, but with most varieties this is unnecessary. Cut off the head and tail, being careful to leave no more meat than necessary on the parts removed. Remove the entrails and the dark membrane that in some fish (e.g., mullets) covers the abdominal cavity. Thoroughly clean the inside. The head may be cleaned and used for fish chowder. If you wish to be sure that all blood is drawn out before canning, place the fish in a brine made of one ounce of salt to one quart of water. Allow the fish to soak from 10 minutes to 1 hour according to the thickness of the fish. Never use this brine but once. If the meat of the fish is very soft or loose, it may be hardened by soaking in a brine (strong enough to float an Irish potato) for from 15 minutes to an hour, depending on the thickness of the pieces and the softness of the flesh. 1. Remove the fish from the brine where it has been placed in order to draw out all the blood and to harden the texture of the fish. 3. Cut into can lengths. 4. Place fish in a piece of cheesecloth or in a wire basket and blanch in boiling water from three to five minutes. Three minutes for the soft flesh fish, such as suckers, crappies, whitefish. Fish with a firmer flesh, as pike, muskalonge and sunfish require 5 minutes blanching. The blanching removes the strong fish flavor and cleans the outside of the fish. 5. Cold-dip the fish by plunging into cold water immediately. This makes the flesh firm. 6. Pack in hot jars or cans to within ½ inch from top. Add 1 teaspoonful salt per quart. Put on a good rubber and partially seal the jar, completely seal tin cans. 7. Place jars or cans in canner and process in boiling water for three hours. Three hours sterilization will insure the keeping of all varieties of fish, providing fresh products are used and the blanching and other work is carefully done. If canning with a steam-pressure canner or a pressure cooker sterilize for one hour and a half under 10 to 15 lbs. pressure. 8. At the end of the sterilizing period cool the jars quickly after sealing completely. The tin cans may be cooled by immersing them in cold water. 9. Store for future use. This can be done satisfactorily under pressure. The bones of fish are composed of large quantities of harmless lime, bound by a matrix of collagen, which is insoluble under ordinary conditions. When subjected to a high temperature under pressure this collagen is converted into gelatin and dissolved, leaving the bones soft and friable and even edible. Bony fish, such as herring and shad, which are too small to use otherwise are greatly improved when subjected to steam under pressure. 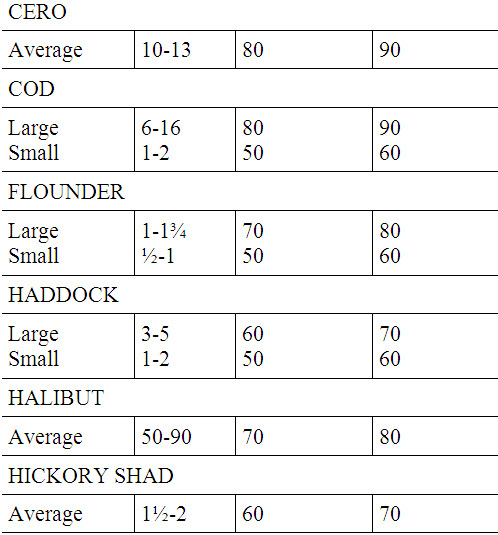 The bones in herring are softened in 37 minutes at a temperature of 240 degrees; shad in 1 hour; flounder 1 hour. Other fish are fully cooked and the bones softened in times approximately proportionate to the size of the bones. 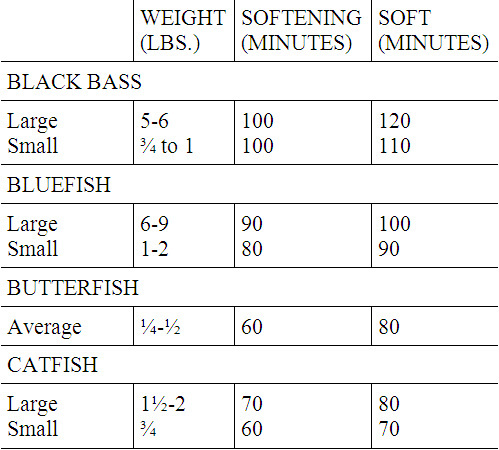 The following table was made after many experiments and gives the time required to soften the bones in many common species of fish. The term "softening" means the point in cooking when the small bones, ribs, etc., are soft, but when the large vertebrae are not yet sufficiently soft to be consumed along with the meat. In some of the larger fishes where the large bones could scarcely be eaten, even if they were softened, it would appear to be a waste of time and fuel to carry them to a point of complete cooking, and in such cases it ought to be sufficient to soften the small bones and sterilize the contents of the can. For such a purpose, the "softening" rather than the "soft" point, may be used. The time periods are measured from the point when the given pressure and temperature are reached (at the top of the cooker) to the time when the heat is shut off. The heating-up and cooling-off period of time are therefore not included. The fish were salted, but no water was added. Samples of fish canned during the course of these experiments were kept six weeks at room temperature (about 68° F.) and were then incubated at 98° F. for 48 hrs. All were sterile. 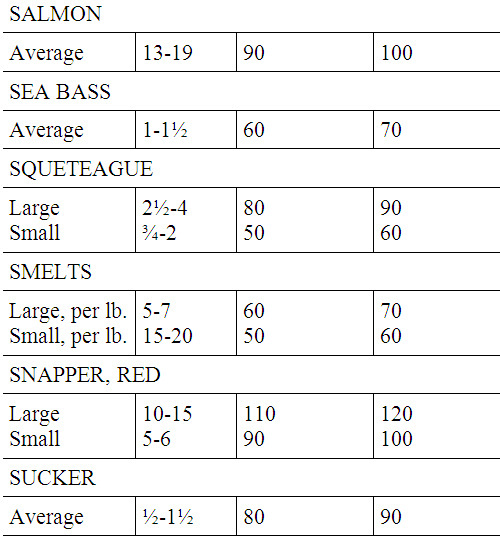 TIME REQUIRED TO SOFTEN THE BONES OF VARIOUS SPECIES OF FISH IN QUART JARS OR NO. 3 TIN CANS, 10 LBS. PRESSURE, 240° F.
1. Clean the fish and remove entrails. Split along the back and remove backbone. 2. Place in brine strong enough to float an Irish potato. Allow fish to remain in this brine from 10 minutes to 1 hour according to the thickness of the flesh. This draws out the blood and hardens the meat. 4. Cut in pieces that can go through jar or can openings. 5. Roll in cornmeal or other flour, dip into beaten egg and roll in flour again. 6. Then put into frying basket and fry in deep fat until nicely browned, or it can be sautéd in bacon or other fat until well browned. 7. Drain well by placing pieces on coarse paper to absorb excessive fat. 8. Pack into hot jars or enameled tin cans. 9. Add 1 teaspoonful salt per quart. Add no liquid. 10. Partially seal glass jars. Completely seal tin cans. 11. Process 3 hours in hot water bath outfit. Process 1½ hours in steam pressure (10 to 15 lbs. pressure). 12. Remove from canner. Seal glass jars. Cool quickly as possible. Prepare and bake fish same as for table use until half done. Pack in hot jars, add salt and sterilize three hours in hot-water-bath outfit or 1½ hours in steam pressure or pressure cooker, 10 to 15 lbs. pressure. Rub the fish inside and out with a mixture made as follows: to 50 pounds fish, mix 2½ pounds salt, 2½ pounds brown sugar and 2½ ounces saltpeter. Let the fish stand in a cool place for 48 to 60 hours with the mixture on, then wash and drain. Fill into glass jars or enamel lined tin cans and add the following sauce until cans are nearly filled: ¼ pound whole black pepper, 1½ pounds salt, 1 pound of onions chopped fine, ½ ounce bay leaves, ¼ pound whole cloves, 2 quarts cider vinegar and 25 quarts of water. Soak the pepper, cloves and bay leaves for 48 hours in the vinegar. Put the water, salt and onions in a kettle. Bring to a boil and cook 30 minutes, then add the vinegar and spices. Let boil for one minute. Strain and it is ready for use. Sterilize for 3 hours in hot-water-bath outfit. Sterilize for 1½ hours in steam pressure or pressure cooker (10 to 15 lbs. pressure). Rub fish with salt, brown sugar and saltpeter as above directed. Wash and dry thoroughly in the sun. Spread on wire screens and dip in oil heated to a temperature of 300 degrees. Use a strap handle plunge thermometer to determine heat of oil. Cottonseed oil may be used for this purpose, although olive oil is best. As soon as the fish are cool enough to handle, pack tightly in cans, filling up with the hot oil. Sterilize 3 hours in hot-water-bath-outfit; 1½ hours in steam pressure or pressure cooker (10 to 15 lbs.). Handle same as specified under "Another Formula for Miscellaneous Fish," except pour in the following sauce instead of pepper, cloves, onions, etc. : Ten gallons of tomato pulp (mashed tomatoes and juice with cores, seeds and skins removed); 1 gallon cider vinegar, 1 pint Worcestershire sauce; 2½ pounds red sweet peppers; 2½ pounds sugar, 2 cups salt, 2 pounds onions (chopped fine); 1 pound West India peppers and 1 ounce Saigon cinnamon. The fish are processed same as "Fish in Oil." Enamel lined cans or glass jars must be used. The cleaned heads of any fish, the backbones cut out of large fish with what meat adheres to them and all other fish scraps may be used for fish chowder. Put all these parts in cold water (to cover) and cook until all the meat can be easily removed from the bones. Pick all the meat from the bones, strain the fish liquor and return it with the picked fish meat to the kettle. Add the following ingredients: To every two pounds of fish picked from bones and the liquor in which fish was cooked add 6 onions, diced or sliced thin; 6 potatoes, diced or sliced thin; 2 tablespoonfuls fat; 1 teaspoonful paprika; 2 teaspoonfuls salt or salt to taste. Cook vegetables, fat and seasonings until vegetables are half done. Pack hot in cans and sterilize same as all other fish. When the chowder is opened, heat and add milk according to taste. For canning be sure to use roe of freshly caught fish and only such roe as is known to be good to eat. The roe of some fishes, such as the garfish, is not eaten. Clean the roe by removing the shreds and strings adhering to it and wash well in cold water, being careful not to break the roe. Soak for 2 hours in a brine made of 6 quarts of water and 6 ounces of salt. Drain and pack in hot glass jars or enameled tin cans. Can for the same length of time as other fish. Be sure all oysters that are to be canned are absolutely fresh, have not "soured" and contain no spoiled oysters. Oysters are opened by hand. All oysters should be rejected that have partly open shells, as this is a sign that the oyster is dead and consequently not fit to eat. Rinse the oysters to prevent any pieces of shell or grit from getting into the cans. Blanch 5 minutes. Cold-dip. If the canned oysters are to be sold it is required by law to mark on each can the net weight of solids or meat exclusive of liquids. 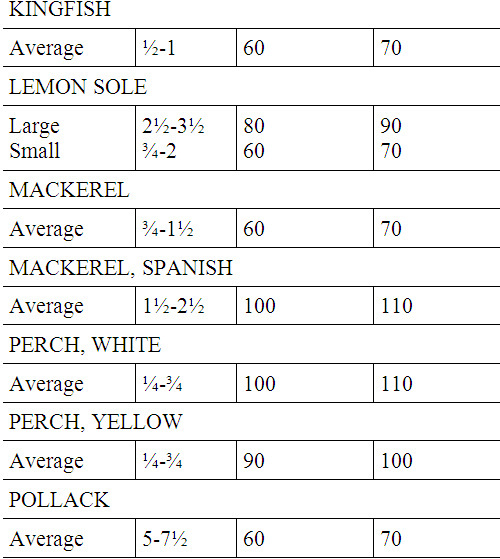 There have been a number of standard grades of oysters recognized on the Baltimore market. They are given as follows: "Standard Oysters" (four kinds). No. 1 cans, containing respectively 1½, 3, 4 and 5 ounces of meat, after being processed in the cans. No. 2 cans, containing respectively 3, 6, 8 and 10 ounces of meat. "Select" and "Extra Select" Oysters contain respectively 6 ounces and 12 ounces for No. 1 and No. 2 cans. The above are the net weights of meats only that have been drained over a strainer with a wire bottom of ½ inch mesh. These are the only grades that have so far been recognized by the trade. An even balance scale, with one platform for graduated weights and another for articles to be weighed, is used to weigh oysters or clams. It is suggested that those who are going to can clams or oysters find out from their prospective customers just what requirements are as to weights and then make their pack meet the occasion. Under no circumstances is it advisable to make any misstatements or misbrand in any respect. After oysters have been packed in the can, fill with boiling brine made of 5 quarts of water to ¼ lb. salt to within ½ inch from top of can. Sterilize as other fish. If clams are received in a muddy condition, it is advisable, though not necessary to wash them before opening. After opening, discard broken or discolored clams. Do not can any clams unless absolutely fresh. Blanch. Cold-dip. Weigh out the amount of solid meat, after draining, that is to go into each can. Weigh and label just as oysters are weighed and labeled. Fill can to within ½ inch from the top with boiling brine made of 5 gallons of water and 1 pound of salt. Sterilize. Place the clams, after being opened, in a kettle with enough cold water to cover. Add a few stalks of celery. Boil for 10 minutes. Season with salt, and pepper to taste and add 1 tablespoon butter to every 50 or 60 large clams. Can. Clam chowder can be made according to any recipe and then canned. Shrimps when first caught are a grayish white color. They are very delicate and spoil quickly if allowed to stand for any length of time in a warm place. There are two general methods of canning shrimp—the "dry pack" and "wet pack." Nearly all the trade now calls for "wet pack" because the other always has a rather offensive odor and the meat is never so fresh and sweet of flavor as the "wet pack." Canned shrimp is very pleasing to the taste and is preferred by many to lobster for salads and stews. Wet Pack. Medium sizes are preferable as very large shrimps are apt to be too tough and too dry. Put the shrimps into a wire scalding basket and lower into a boiling hot salt water solution made by mixing one pound of salt to each gallon of water. Allow the shrimps to remain in this bath for about five minutes, then remove and drain thoroughly. Peel and remove viscera (entrails). The boiling and the salt will harden the meat and make the peeling comparatively easy. Pack into enameled tin cans or glass jars. Nos. 1 and 1½ cans are used almost exclusively. These sizes should contain 4½ oz and 9 ounces of meat respectively. It is unsafe to put in more meat than above directed, for it might cake and become solid when processed. Add a very mild brine to within ½ inch from top of can. For the brine use 1 teaspoonful salt to 1 quart of boiling water. Sterilize. Dry Pack. Handle same as above, except do not pour into the cans any brine. The fish is packed in the cans and processed as follows without the addition of any liquor. Drying of Shrimps. After shrimps are boiled and peeled they may be dried. Spread on a drier of any kind and dry at a temperature of from 110°F. to 150°F. When thoroughly dry pack in dry clean glass jars or in parchment-paper lined boxes. Scale fish, clean and wipe dry. Do not wash. If the fish are large cut in lengths to fill the cans and in sizes to pass through can openings easily. Salmon is usually packed in No. 1 cans or in flat cans. Fill cans with fish after it has been blanched 5 minutes and cold dipped. Sterilize as other fish. Many salmon packers lacquer the outside of their cans to prevent rusting. This is a very advisable point. The test for unsound salmon is the nose. If the contents issue an offensive odor, it is unsound. Freezing does not hurt canned salmon. The fish taught and used for packing domestic sardines belong to the herring family and are said to be of the same species as the sardines of France, Portugal and Spain. There are two methods generally used in canning sardines. First, when the fish are put in a sauce such as mustard dressing or tomato sauce, and secondly where they are packed in oil. The heads are cut off, the scales taken off and the fish cleaned. Blanch 5 minutes; cold dip; drain and pack into the cans dry. Cover with sauce, either mustard or tomato. The fish are prepared in the same manner as above described but instead of blanching them, they are put in wire baskets and immersed in boiling peanut or cottonseed oil until tender. Olive oil might be used, but is rather expensive. When cooked, they are drained, packed into cans in order, and the cans filled with olive oil. It is often advisable to salt the fish while fresh and before cooking as it improves the flavor. Put 5 gallons of water in a large kettle. Add ¼ lb. of baking soda to it. When boiling vigorously throw the live crabs in it and boil quickly for 20 minutes. Remove crabs and wash them in cold water. Pick out all meat. Wash the meat in a brine made of 1 ounce of salt dissolved in three quarts of water. Drain and pack in enameled No. 1 flat cans. Sterilize. As soon as the time of sterilizing is up, plunge the cans immediately into cold water, otherwise crab meat discolors. For this reason, glass jars are not so well adapted to crab meat canning as tin cans. The fish are first cleaned and the entrails removed, then the fins are cut off. The fish are then soaked for about two hours in a salt brine to remove the blood. This brine is made with about 10 lbs. of salt to 8 gallons of water. The brine is then rinsed off and the fish are cooked, either boiled or cooked by steam. When codfish are thoroughly cooked, the meat will drop off of the bone in pieces, and it is very white in color and crisp in texture. These pieces are then broken in suitable sizes and are ready to place in the cans. The cans are filled as full as possible, because after processing the fish will shrink some. The best way to can crawfish is to put it up in a bouillon as follows: Water, 2 gallons; vinegar, 1 quart; cloves, 10; carrots in slices, 6; onions in slices, 6; cloves of garlic, 3. To the above should be added a good quantity of pepper to suit the taste, a little salt and bunch of parsley and a little thyme. Boil slowly for about an hour. Throw in the crawfish after the intestines have been extracted; to do this take the live crawfish in your hand and tear off the wing which is in the middle of the tail; it will pull out at the same time a little black intestine which is very bitter. Boil one or two minutes, never longer, put in cans and process.